Well, this doesn’t have anything to do with what I normally blog about, but bear with it. This is for my English 291 Early British Literary class. Ancient weaponry, especially swords, is something of a hobby of mine. While reading Beowulf, and noticing the importance placed on swords, especially Hrunting, the sword given to Beowulf, I thought it would be a good idea to do a little research into viking swords to provide a little background information to go along with our study of the text. 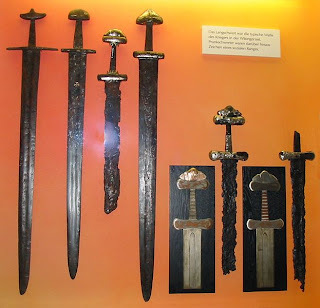 Just to provide a little background, I’ll briefly go over the evolution of the viking sword, starting at the Iron Age. At the beginning of the Iron Age, iron replaced bronze as the primary material used to create swords and other weapons. The story of the viking sword most likely used by Beowulf begins with the Celtic culture at the dawn of the Iron Age. The Celtic sword, several examples of which are shown in the image above, were relatively crude weapons when compared to later steel weapons. Quenching techniques had not yet been developed so iron swords were created using the same forging techniques used to create bronze swords. During this period, however, smiths learned new techniques and slowly discovered the method by which to make steel, which resulted in swords that were harder to break, and more capable of holding an edge. 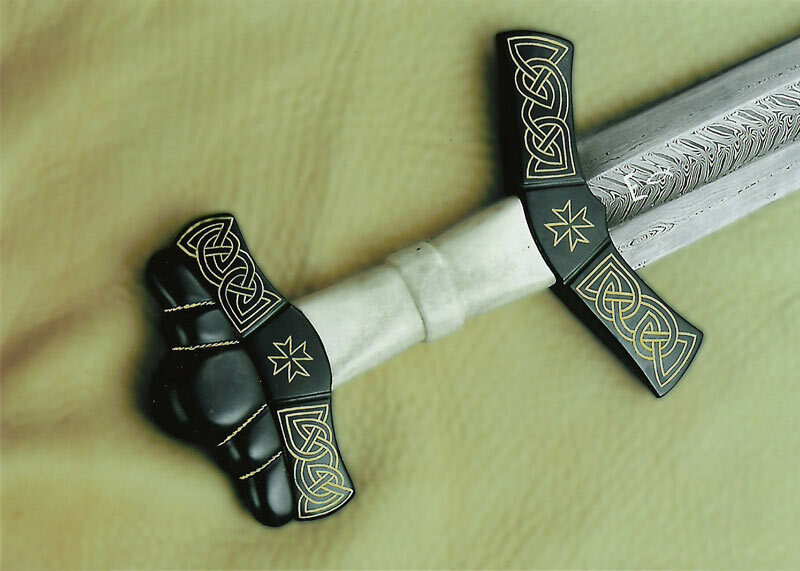 As the Celtic culture declined, other cultures picked up on their iron and steel working techniques, which led to the creation of several swords inspired by the Celtic design over the course of history. The next step in the evolution of the Viking sword was oddly enough carried on by the Romans. The Roman Gladius is a fairly iconic sword, that is recognizable even by people with no interest in historical weaponry. It was a short steel sword, similar to the Greek swords, used in close quarters. The Gladius was not the primary weapon of the infantry, who focused instead more on tight formations and the pilum, or spear. Strong similarities can be seen between the Roman Gladius and the Celtic swords, especially in the shape of the grip, which in both cases does not feature a cross piece. Before the Gladius developed into the Viking sword, however, there was one more evolutionary stage, that also took place among the Romans. 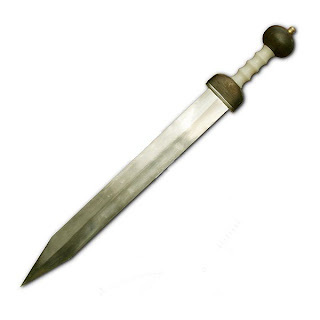 The Spatha was a much longer sword than the Gladius, and was developed for use by Cavalry officers, who would have need of the longer reach the Spatha provided from horseback. Their use was widespread among the conscripted Germanic troops, and found wide use among heavy infantry in later years. Eventually it replaced the Gladius among front line troops, providing them with a longer reach. The Spatha eventually traveled north, where it was developed into the weapon used by the Norsemen, and Vikings. The Viking method of forging blades was passed down from the later Iron Age, around the time that steel was developed. 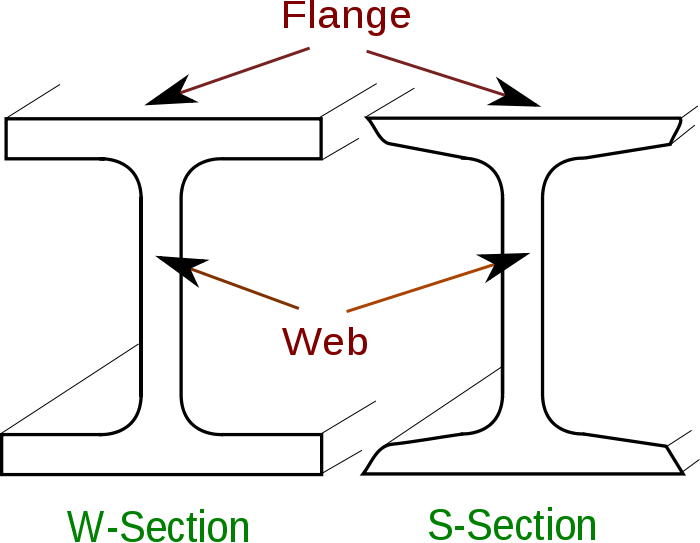 The technique was referred to as Pattern Welding, and was the answer to the two main problems that iron and steel swords had. Iron, while much harder than bronze, was still not quite hard enough to hold an edge. It was a fairly malleable material, but could still be beaten out of shape, and had to be regularly sharpened. Steel on the other hand was much harder and could be sharpened to an edge, and retain that edge. However, it was also brittle, and could easily shatter if the force of impact was large enough. 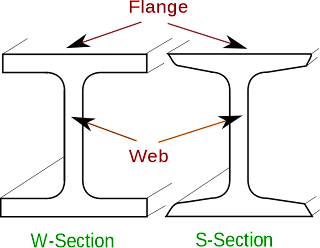 Pattern welding took the advantages of both materials, and combined them to negate the disadvantages of both. For those familiar with the Japanese style of sword forging, they already now that the Katana is created by folding a harder steel layer over a softer iron core. The folded edge would then be sharpened and hold the edge, while the soft iron on the inside absorbed the vibrations of impact during combat. However, the method of folding the steel over the iron leaves the soft iron exposed on one end. This was not an issue in the case of forging Katanas, as the soft edge was also the inside of the curve, and wasn’t used for fighting. Viking swords, and its predecessors, however were all double edged weapons. Meaning that folding the steel over the iron was never an option, as the edge that would be created would remain the weaker edge. Instead of folding, while a viking sword was forged the smith would take a bar of iron, and five smaller bars of steel. Keeping the iron in the center the smith would then weave the bars of steel around the iron, creating a blade that perfectly encased the iron center, and created a steel shell that could be beaten and sharpened into edges. Because of this forging technique, Viking swords had both the properties of iron and steel. They were hard, held an edge, and could not be bent out of shape. They were also flexible, and could bend just enough to prevent them from shattering after use. A common feature of Viking swords was a fuller, which ran down the length (31.5″ long) of the blade in the center. It was a groove that served the dual purpose of lightening the blade, but most importantly it served to stabilize the blade, and allow it to keep its straight shape more effectively. To understand how this works it helps to think of the blade as a I-beam. The I-beam provides rigid support during construction, and is lighter and stronger than just a regular steel beam could be. Because of its shape the three plates of metal prevent each other from bending out of shape. I apologize if I can’t really explain it, I’m not an engineer, but this is how it was explained to me by a researcher of medieval weaponry. Another iconic, not functional, feature of Viking blades can be seen on the pommel, the counterweight at the edge of the hilt. Usually, to some variation or another the pommel featured five nubs arranged along the bottom of the pommel. Oddly enough, the sword was not the preferred weapon of Vikings. Instead the average Viking would choose cheaper weapons such as axes and spears. Swords were reserved for the richer members of society, those that could actually afford them. Beowulf, being a Prince, would definitely be one such who could afford such a weapon. What’s even more interesting is Unferth’s gifting of Hrunting to Beowulf. If the sword was even half as magnificent as it is described as, then Unferth was a wealthy man indeed. Even more impressive is the fact that he gave this weapon to Beowulf, and what an incredible gift it was. Considering how Unferth was Beowulf’s main challenger, and generally displayed suspicion towards Beowulf, this event marks exactly how much Unferth’s opinion of Beowulf had changed. Not only that, but it marked exactly how magnificent Beowulf was, that his deeds were so great that they caused a man who had challenged his claims to not only change his opinion, but to provide Beowulf with such a noble and rich gift.